The tweet left me more worried about our educational problem than our refugee problem. 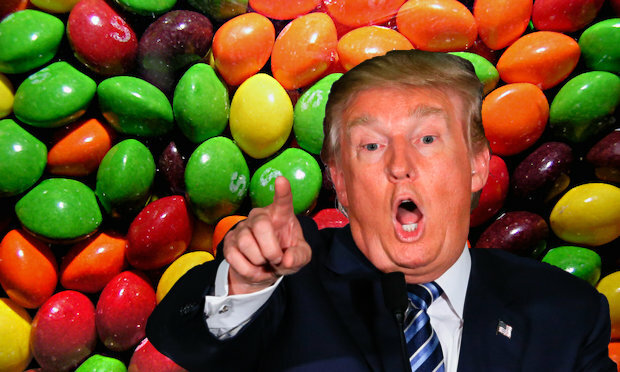 Trump Jr. failed to capitalize Skittles, a brand name — surprising for someone whose whole career involves maintaining the Trump brand (or is that the “trump” brand?). The punctuation is wrong, leaving the message to start with a sentence fragment of the kind corrected in elementary school grammar classes. The photo of the Skittles was taken by a former refugee from Cyprus and used by Trump without payment, even though it was copyrighted. So Trump Jr. condemns refugees while exploiting them — and his math is as bad as his grammar. According to a report last week from the Cato Institute, a conservative think tank, the odds of an American being killed in a terrorist attack by a refugee is 1 in 3.64 billion in any given year. That means you’d have to eat 68.7 million handfuls of Skittles before you found Trump Jr.’s poisoned one." Read the Washington Post, Kareem Abdul-Jabbar: Trump is so scared that he wants us to dismantle the Constitution. In the debates, Clinton should comment about how all those different colors of Skittles together are so good. Who wants a bag of just hateful angry Skittles?" Then hand Trump some Skittles! Inspired by the Washington Post, Skittles gave the perfect response to Donald Trump Jr.